Do you know how much of your personal data is stored on the cloud? 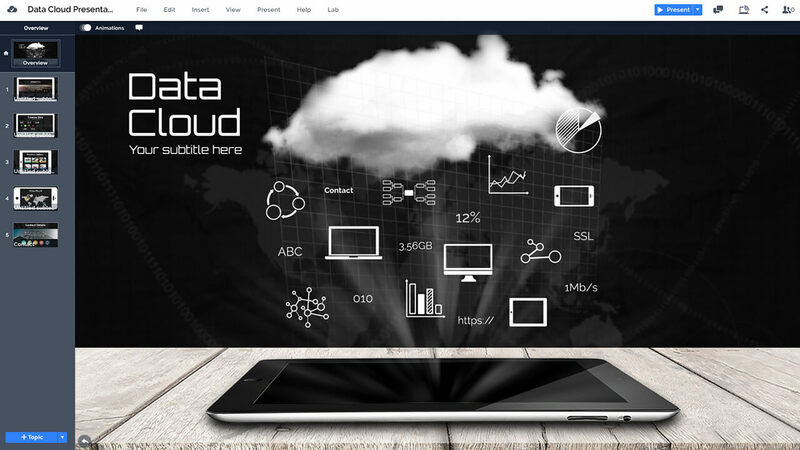 A cloud data, information and technology related prezi next presentation template. Black tablet computer on a wooden surface and a hologram display of cloud network data hovering above it. Zoom into the screens of various devices: smartphone, tablet, laptop and monitor to present your content. Great template for talking about digitalization, cloud data computing, internet security, online technology. Has you personal data ever been stolen or hacked yet? Don’t worry, it’s just a matter of time! Use this technology themed template for making a Prezi presentation on the same topic. A black iPad tablet computer lying on a wooden surface with various business and data related icons hovering above it. A great concept to illustrate big data, cloud data hosting, web hosting or mobile and internet traffic. The overview slides includes a placeholder for a title and subtitle text. Advance the presentation by zooming into the technology device screens. You slides appear on the laptop, monitor, smartphone and tablet screens as you zoom in. A very futuristic presentation template which is perfect for introducing an online technology related company or business model. Easily move the symbol elements around, add more or delete to make it suitable for your topic. A great template to illustrate the problems and issues of a modern society for example: data being stolen, new data privacy and protection laws like GDPR, storing data in the cloud, hosting web servers, mobile internet traffic or data connection infrastructure. Available both as a Prezi and PowerPoint PPT template. 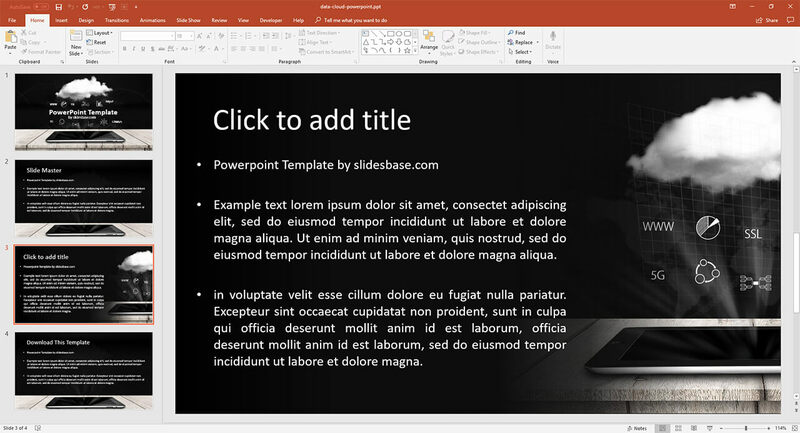 A PowerPoint version of the Data Cloud template is also included in the purchase. 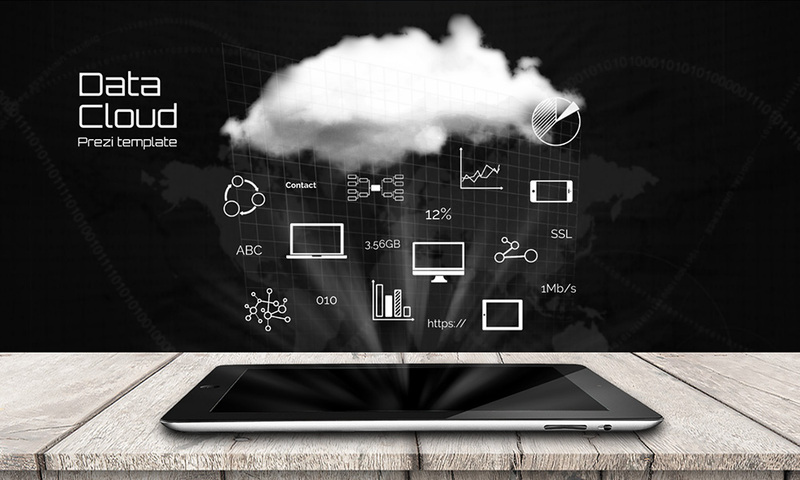 The PPT version features the same network related graphics with a tablet computer and a realistic data cloud hovering above it with telecom and business related icons. It’s raining men… information – a great template for making a presentation about the upcoming 5G network changes. This entry was posted in Best Prezi presentation templates, Prezi Next Templates and tagged amazon, big data presentation, cloud, cloud computing, cloud network presentation template, cloud system, cloud technology, computer, connect, connection., data, data analysis presentation templates, data cloud, data collection presentation presentation, data management presentation presentation, data presentation, data presentation presentation, data presentation template, data representation presentation, display, download, hologram, infographic, information, internet, IOT, ipad, mobile, monitor, network, online, prezi next template, quantitative data analysis presentation presentation, security, server, smartphone, system, tablet, upload.